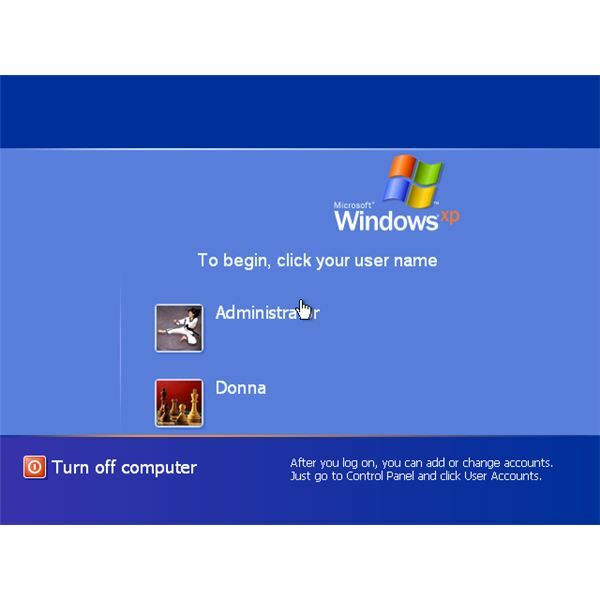 The Windows operating systems uses a login box in the Welcome screen if the computer is password-protected. The Welcome screen will not display the login and password box if auto-logon is enabled. Some people have reported that they have no cursor in the password box at the login screen after installing updates to Windows or applications. Users can login even though the asterisks do not appear in the password box, however. If there is no cursor visible at the login screen, you need to try to login using the classic logon style. Simply press CTRL+ALT+DEL twice to bring up the classic logon style. Proceed by typing the user name and password. If it is not already selected, click to select the Use the Welcome screen check box. Click to select the Use Fast User Switching check box, and then click Apply Options. Quit the User Accounts tool. Open a command prompt by typing cmd.exe in the run box in Windows. Vista and Windows 7 users may need to right-click cmd.exe and run it as administrator. In the command prompt window, type regsvr32 shgina.dll and hit the enter key on the keyboard. Close the command prompt window and then open the registry editor by typing regedit.exe in the run box. In the right pane, determine if there is GinaDLL with REG_SZ value. If there is GinaDLL, a third-party application may have added it. Remove or update the software that you recently installed. However, if GinaDLL is not present, use the guide below to troubleshoot the problem. If the above methods did not help or GinaDLL is not present in the above-mentioned registry entry, start troubleshooting by viewing the Event Viewer logs. Take note of the recent event log that contains error information, Event source and ID. The said information will help you to identify the cause of the problem. If you recently installed a security update, e.g. KB884883, KB923191, KB908531, KB893086, KB921398 or KB900725, troubleshoot by removing the said updates. If the Welcome screen displays a cursor in the password box, report the problem to Microsoft to request a hotfix. Before removing any of the above updates and before requesting support from Microsoft, make sure that you also try to update Windows. Some security and component updates for Windows have been re-released. Check the Windows Update website (for XP) or Windows Update program (in Vista and Windows 7) for new and re-released updates. Re-released and new updates contain fixes to known issues in Windows such as no cursor in password box at login screen or blue and black screen after a successful logon.